Each year we tell home sellers not to get too excited about showings until about mid-January. Showings and contracts tend to increase as the month goes on and builds throughout season. 2017 however is different. Southwest Florida home sales are heating up earlier than past years. Could it be there was pent-up demand from 2016? We think so. 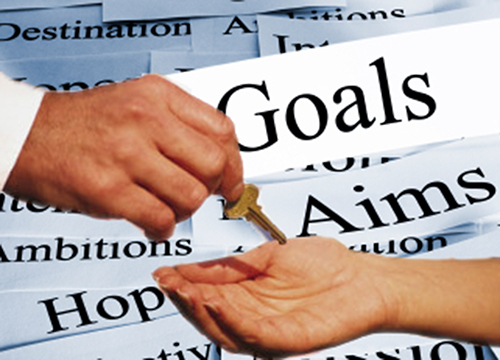 Our team set a goal to sell 4 homes this past week. We sold 6. Our agents have been out showing every day, sometimes working with 2-3 buyers per day this past week. Sure, some of these are buyers in our pipeline we’ve been working with for weeks or months until they arrive. Others are new buyers we’ve attracted to our website or referral calls. In any event, activity has picked up earlier than past years. 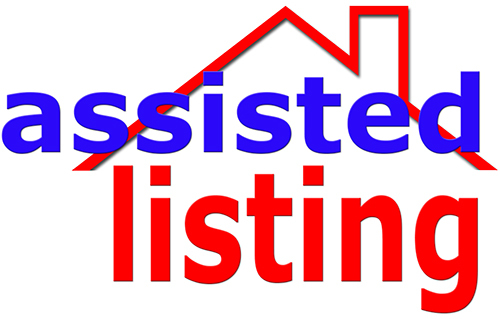 Showing activity on our listings from other agents has picked up too. Combining this with what our team is seeing leads us to believe the market is heating up. So I went to MLS and did some checking. In the first 10 days of January 309 properties have gone under contract. The average list price is $317,843 and the median list price is $230,000. These prices are pretty much in line with recent sales numbers. What’s encouraging is the number of properties going pending so early in January. This potentially bodes well for an excellent season. 2016 was a year in which the number of transactions was down. It was a year in waiting. It seems people were waiting on the election, waiting on the economy, waiting on something. Now there is renewed hope and optimism and we hear it. People have renewed confidence in jobs staying in America. The U.S. has its swagger back and people are optimistic. Even the people who threatened to leave if Trump got elected are staying. This article isn’t a political post. The United States is the greatest nation on the planet and people recognize that, even if their candidate didn’t win. We think 2017 is going to be a better year in real estate than 2016. Prices were largely flat in 2016 and sales volume was down. We think we’ll see rising sales volume, and who knows where prices will head. Rising interest rates could dampen price gains, or not. They’re still low. Rising inventory could dampen price gains, or not. Sometimes I think sellers haven’t listed because they didn’t know where they wanted to go. As inventory rises, more choices open and it could spur more sellers to act. It’s a cycle that could really get the economy moving again, raise tax revenue to the state, and sales tax revenue to local governments as people buy appliances, flooring, etc. for their new home. Where 2017 goes is an open book yet to be written. Way too early to predict or know for sure. We are encouraged by the flurry of activity so early in the season. It just seems like 2016 was a year in limbo and 2017 is a year of action. People don’t wait forever. They move on. They move forward. If you’d like to search for your piece of paradise, check out www.LeeCountyOnline.com You can search the MLS like a Realtor as our database has all the listings and it’s updated every 5 minutes. You can also get a Free estimate of your home’s value. If you like the value and want to talk to us about your options, call us at 239-489-4042 Ext 4. Brett or Sande will be happy to talk to you and make sense of the process. If you don’t like your home’s value, don’t give up. It’s just a computer, and it’s not 100% accurate. How could it be? It’s never been inside your home. We’ll be happy to look at it with you. Sande and Brett are experts at getting Top Dollar for your home, because our marketing works. Just give us a call. 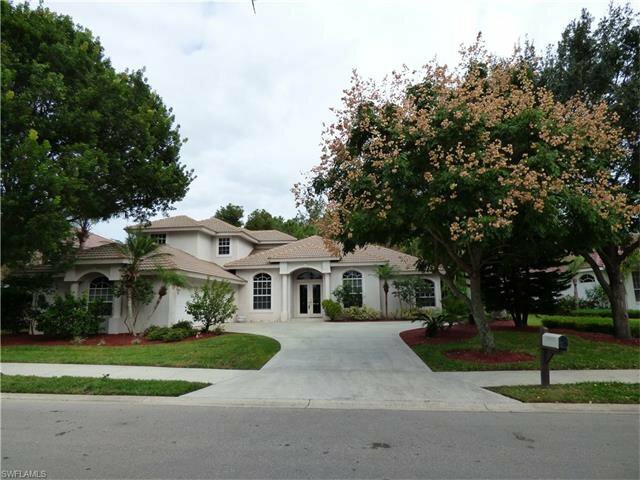 Posted in Cape Coral, Cape Coral Real Estate, Fort Myers, Fort Myers Beach, Fort Myers Real Estate, Lehigh Acres, Open House, Southwest Florida Real Estate. Over the holidays, I had the chance to speak with several Realtors at various parties and get togethers and find out what are other agents saying about SW Florida real estate market. We work with other agents every day, however there is something about getting a bunch of agents together in one place and discussing what they’re seeing in the market. Each one that I spoke with had similar observations. Buyers and sellers seem to share an anger. When both are angry this is an indication the market is in flux. Each side has certain expectations and neither are being met. If you’ve ever watched American Idol, some of the best episodes in the beginning of the season are when they show singers who think they are good. They’ve been told all their life how wonderful they sing by friends and family. Nobody wants to disappoint them, so they don’t tell them the truth. It may help their ego for a while, but secretly people are laughing at them because their talent doesn’t match their perception of themselves. The real estate market can be like that sometimes. Most people know what a seller’s market is, and most know what a buyer’s market is. Imagine being a seller believing wholeheartedly it’s a full-blown seller’s market and buyers are just beating down doors to buy any home they can. And imagine a parallel universe where buyers believe it’s a full-blown buyer’s market and sellers are practically giving homes away. When you merge these two universes together, each one begins to realize their expectation of what the market is, or what they think it should be collide. And when these universes collide, each side becomes frustrated. Therefore, now more than ever buyers and sellers need agents. When either side is confused about reality, or angry, or sometimes both, transactions do not get done without the help of a professional. In 2016 transactions were down about 15% or more. We’ll wait for year-end calculations on that. Anger shows up when it shouldn’t, and it kills deals. Regular inspection items become mountains, because the buyer has fear, or doesn’t feel like the transaction has been fair to them. Rational or not, buyers bail. Or sellers refuse to fix the most basic items; items they’d fix if they were staying in the home anyway. If the seller is angry or doesn’t feel like they’ve won, sometimes they turn off and tune out and kill deals. What neither side fails to realize is that winning is the culmination of attaining a goal. The goal was to either buy a house or sell a house. Anger gets in the way. They judge wins and losses by who got the better of the deal, not whether the deal closes. Now many items are important. We’re not making light of that. Agents work tirelessly every day to bring a transaction together, and lots of things must happen to make that reality. We’re talking about the silly things that shouldn’t rise to deal-breaker status but do because of emotions. When you’re in a transaction, you can convince yourself of anything, and you’d be right. Most buyers and sellers appreciate having a professional guide them. They can bounce ideas off their agent, and an agent can give them a professional perspective on how to handle it, and which items are worth arguing about. Imagine 4 siblings fighting over a toy. Or arguing about who started the fight. You’ve all heard “But she started it”. As a parent, you know the kids can’t see the big picture because they’re caught up in the emotion of who is getting the fair shake. They don’t realize that the parents aren’t necessarily picking a favorite, they’re just arbitrating what is fair this time, until the next argument 10 minutes later. We don’t see buyers and sellers as children. However, children and adults alike are people, and emotions take over. It’s human nature. To combat emotions, we like to use facts, data and logic. We study the market and counsel buyers and sellers to actual market conditions. We help get you from Stuck to Sold. Call the Ellis Team 239-489-4042. Let’s make your next transaction in 2017 a success. Feel free to search for homes www.LeeCountyOnline.com Our data is updated every 5 minutes, so you’ll get the latest listings when seconds count. Test out our Neighborhood Market Reports You’ll find useful information about listing and sales activity for dozens of neighborhoods. If you don’t see your’s listed, you can create your own and save it. A financial term you’ll regularly hear bandied about is “Money in Motion.” Money in motion creates opportunity when money is active and circulating and things become stagnant when people sit on their money and save. We like to measure the Southwest Florida real estate money in motion by the number of home sales there in a month and multiply by the average sales price. It gives us a clue as to the overall activity in the market. When home sales are up and prices are down, they offset each other. When both are down, money in motion is down. If both are up, the money in motion is most assuredly up. 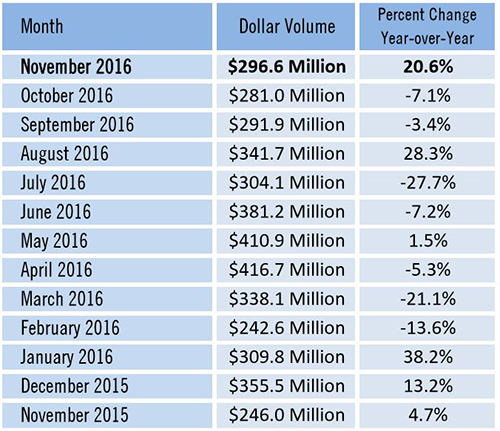 As you can see by the chart, the total dollar volume in November was up 20.6% That’s the good news. For the better part of 2016 money in motion has been down. This is why agents have been complaining that their sales and earnings have been off. Home sales have been off all year to the tune of 15-20%. Prices have been up against last year’s numbers but they’ve been flat all year. We haven’t really seen significant price gains in the market since November 2015. Sellers measure the health of the market simply by the direction of prices. Some agents do too. Experienced agents look at the whole picture; prices and number of sales. By multiplying and tracking the two, you can identify trends in the market. Understanding each component of the money in motion principle helps explain what is happening and why which leads to what the market may do in the future. 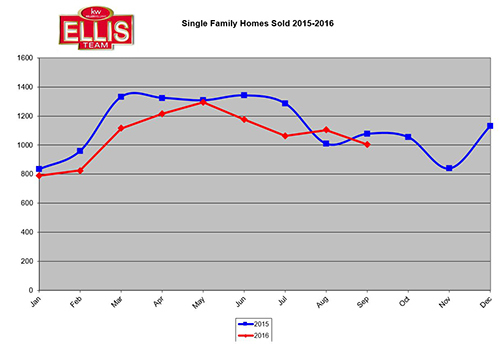 Home sales picked up in November. They were up 16%. Average prices picked up too, up 3.6% What helped with prices is last year’s numbers were adjusted down. Unless something changes, year over year prices will be flat going forward. If this remains true, total dollar volume will be influenced more by number of sales than price gains. 2017 will be more positive than 2016 in our opinion. We can’t say whether it will come in the form of price gains. Expect transaction volume to increase as more sellers decide to sell. We have a balanced market right now where neither seller nor buyer have the overall edge, except in certain price ranges. 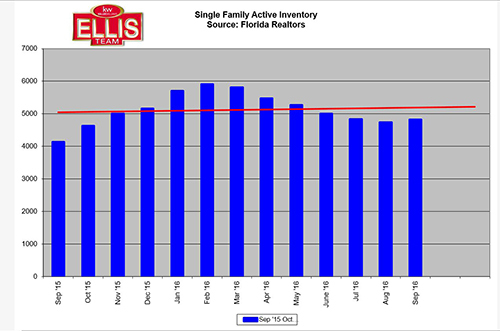 See last week’s article Southwest Florida Real Estate Inventory Supply Increases in 4th Qtr. There is renewed optimism in the economy post-election. 2016 was a year where consumers and business sat on their hands. Both seem poised to start moving again. We could see more sellers begin to trade-up, or move to a different lifestyle home. We could see more baby boomers buy 2nd homes in Southwest Florida. Retirees may flock here because their 401k’s have been doing well. No matter the reason, increased money in motion creates opportunity. Interest rates are rising, and the Fed has signaled last week’s rate hike won’t be their last. In fact, they predict 3 more rate hikes in 2017. Borrowing costs will be higher going forward. The early bird gets the worm. Actually, late birds will get the worm too, it’ll just cost them more if getting a mortgage. We’ll be tracking the money in motion for you in 2017. Sellers need agents more than ever as competition heats up amongst sellers. Buyers need agents too to assist them in sorting out total cost of ownership and factors which could affect the buyer. If you’d like to get a head start you can search for your dream home at www.LeeCountyOnline.com Beat out other buyers to hot new listings. Save your search and let the system notify you of hot new properties that match what you’re looking for. Or let one of our buyer agents help you search, just give us a call. If you’re a seller, please call us at 239-489-4042. Ask for Sande or Brett. We handle the marketing for the Ellis Team and we can help you achieve Top Dollar for your home in 2017. Congrats to Pam Belcher our Ready For a Yeti Contest Winner! 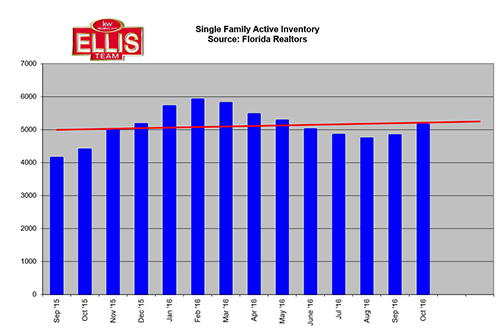 The Southwest Florida real estate inventory supply increases in the 4th qtr. All price ranges except two increased with the most pronounced increases occurring in the $400,000 and up range. In December, the $400k-600k range shot up almost 2 months from 9.34 months in September to 11.15 months currently. The $600k-$1 Million shot up from 12.57 months to 14.69 currently. That’s over a 2 month jump. The biggest jump occurred in the $1 Million+ range where there was a 17.03 month supply back in September. Today that number stands at 21.04 months. That’s almost a 4 month jump in supply just since September. It pays to know where your home stands in the supply chain. It tells you how aggressive you must be when selling your home. The overall market stands at 5.65 months which is a healthy number. People read headlines and hear there is a 5.65 month supply, so homes must be selling fast. They figure with homes selling so fast it’s probably easy to stick a sign in the yard and sell it. Even at the lower price ranges there are still many homes that do not sell, because they are over-priced. If they were priced correctly and properly marketed, they would sell. The demand is there, at the correct price. As we go higher in price the demand is still there, it’s just that the supply is even greater. Recently more homes are coming to the market than are selling, hence why we have increasing supply. We can’t look at the overall market and assume all homes are selling the exact same. Just as we can’t assume that all cities in Florida are behaving the exact same. Real estate is local, and it is segmented. Certain cities or neighborhoods sell better than others. This can be due to economic factors, or perhaps location. The closer to beaches, or top schools can affect values. Lee County is getting ready to change how children are selected for schools starting in 2018. This may put an end to the zoned system and busing system as we know it. Children will go to schools closer to where they live, and this could affect values. Segments also affect the market. Sometimes the low end is red-hot, and other times the mid to upper markets make a comeback. Generally speaking, the lower the price the greater the demand as more people can afford lower prices. Not everyone can afford high-end real estate. Just because Southwest Florida Real Estate Inventory Supply Increases in some price ranges doesn’t mean it increases for all ranges. In fact, a few decreased. Right now we have an affordable housing crunch in Southwest Florida. Rents are high, and so are median sales prices relative to what the average working person can afford. It makes it difficult to find housing close to where you work. We saw this back in the housing boom too. This doesn’t mean our market is over-inflated. It just means there is a cap to how much more and how fast it can rise until incomes pick up. The big price gains may be over, unless the economy comes roaring back. Our US economy has essentially had free money for the past 8 years and it’s done nothing except help the stock market. If jobs and economic activity return like it’s believed they will post-election, our real estate market could be in for more good times. If nothing changes, we could be in for flat to modest gains. We think 2017 is going to be a year of change. Home sales may pick up even though rates will continue to rise. Proper pricing and aggressive marketing will become even more important, and the people who act quickest will save the most money when rates rise. You can search the MLS for Free at www.LeeCountyOnline.com. Our database has all the homes, and it’s updated every 5 minutes directly from the MLS. It will even notify you of new homes or price changes if you save your search. You can always call us at 239-489-4042 and we’ll be happy to discuss your buying or selling options. Congrats to our Ready For a Yeti contest winner! Southwest Florida listing inventory rises in October to 5,157 units, up from 4,829 in September. That is a 6.79% rise in just one month. 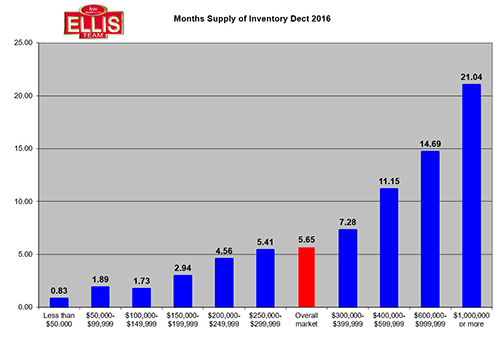 We went back to last year and noticed listing inventory rose 6.09% those same months, so inventory is rising a bit faster this year. Home inventory was up 16.64% this past September over 2015 and in October it’s up 17.42%. We’ve been mentioning all year 2016 has been a leveling off and balancing market, so rising inventory isn’t surprising. In fact, it was predicted. November statistics won’t come out until next week. We’ve been studying preliminary numbers and from what we can tell, median and average sales price are going to be fairly even. Perhaps a small gain on median price and small loss on average price. However, we can only track Lee County numbers submitted to our MLS. If our numbers are correct we may see an uptick in number of closed sales in November. Also frustrating is the fact that they go back and adjust last year’s numbers, so that can influence predictions as well. We searched active homes on market on December 13th and we found 5,104. If we add back in the pending and contingent listings we have 5,955. We’ll be watching the official November stats when they are released next week. As you can tell from the chart, the trendline is up slightly. Some people believe we’ll see more homes hit the market as interest rates rise. Others believe we may see less as sellers may decide to stay in their low-cost mortgage. I can tell you one thing. If you currently own and your home no longer works for you, the time to list is now. We need to get your home sold and you into your new home before rates rise again. They’ve already risen about .75%. This will cost you more to finance the same amount, so waiting will cost you tens of thousands over the life of your new loan. Did you know you can search the entire MLS from our website? It has all the homes, and it’s updated every 5 minutes, so you’ll be the first to know about new homes as they enter the market or change their price. You can even save your search, and have multiple saved searches in case you’re looking at different options. We even have a free tool to find out what your home is worth online. The Ellis Team is also busy meeting with potential sellers. We counsel sellers on how to get top dollar for their home and how their home should be positioned and marketed in the marketplace. Sellers are finding out there is a difference and listing with the wrong Realtor can cost them thousands. Don’t list with a Realtor that doesn’t bring you top dollar. You might ask, what’s our secret for getting top dollar? We’d love to show you. It’s not by accident, it’s by design. Let us sit down with you and show you how our 30+ years in the market combined with today’s latest technology and aggressive marketing is making a difference for our sellers. If you think hiring a professional is expensive, wait until you hire an amateur. Our team is growing. We have thousands of buyers in our database looking to purchase. If you’re an agent looking to grow your business, give us a call. If you’re a potential seller looking to sell before rates go up, give us a call too. Put our experience and wisdom to work for you. We’ve been through changing markets before. Rising rates change the game and knowing how to help buyers and sellers can be the difference to keeping your deals together and saving everybody money. You can call us at 239-489-4042. If you’re considering selling, ask for Sande or Brett Ellis. By the time you read this article Thanksgiving will be a distant memory as attention turns to holiday shopping, upcoming family get togethers, office parties, etc. We thought it might be an appropriate time to give thanks in SW Florida before the holiday rush. I’m thankful the election is over. I was over it months ago really and Election Day couldn’t get here soon enough. Now that the election is over, we can reflect on what the results might mean for our real estate market. Interest rates are rising. This was the case regardless of who was elected president, so we have some headwind there that doesn’t help. However, rates are still very low and shouldn’t pose a big problem anytime soon. We are hopeful parts of Dodd-Frank will be repealed. This would help the financing market as onerous regulations have made lenders cautious about lending. The finance industry was to loose before the run-up and they’ve been too tight since. Appraisal regulations are terrible. We’d like to see these revamped as they don’t serve the buyers or the banks well. They’re forcing buyers to lose homes to cash buyers or put more money down when the home doesn’t appraise. It’s a shame because if the buyer loses out because the home doesn’t appraise and a cash buyer comes in and pays what the previous buyer contracted to pay, it proves the home was really worth it. New regulations within the last few years prevent appraisers from reaching actual value, especially on homes that are highest in the neighborhood. Just because there are not comps at that higher price doesn’t mean home isn’t worth it. It just means a home that size perhaps hadn’t come on the market until now. We’re already hearing Apple and Ford may build products in the US that were previously slated to be built out of the country. This is good news. We need manufacturing jobs to come back to the US. Lowering corporate income taxes raises the tax base as more companies do business here, and they hire US job seekers versus lower paying jobs somewhere else. It’s a win-win for the US. More jobs mean a healthier real estate market. We’d like to see the Affordable Care Act reworked so the coverage is actually affordable. We talk to buyers who cannot afford to purchase a home because health care costs have gone up so much. The Affordable Care Act didn’t do much to contain costs, only premiums on those that qualify for subsidies. This didn’t address the problem. We need to control costs, deliver a better product, and make it affordable to more people. It is our hope that the president and congress can work together to solve this issue. Right now many employers will not hire full-time workers. Some small businesses cannot afford to pay under Obama Care either, so it’s a double-whammy. Repealing and replacing that law could fix this and allow businesses to hire full-time people, which will help the economy and real estate markets across the country. We’re not here to argue who would have made a better president, or whether the popular vote or Electoral College is best. Now that we have a president, our focus is on what we can do to get the economy going again. We’ve basically had free money for the last 8 years and that didn’t help like you would think. Change is required, and change is on the way. We think we have the potential to kick-start this real estate market. It will only happen if the economy takes off. Be thankful change is coming, and let’s all hope and pray that change will kick-start this economy. Only 8% of recent home sales were FSBO sales which indicates for sale by owner sales at all-time low for the 2nd straight year. 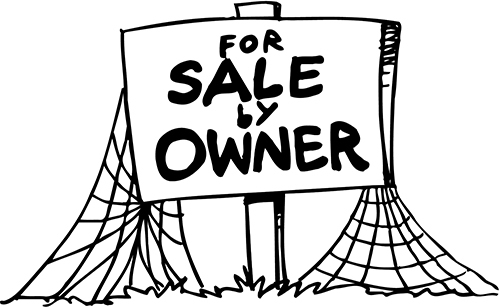 Most for sale by owners want to try and see if they can save the commission, and who could blame them. Everyone wants to save money. What matters most is how much is in your pocket at closing. The average FSBO gives up after 2-3 weeks when they get no showings or so many showings and no offers that they get tired of the process. They don’t know who they are letting in their home and what their motivation is. If it’s risky for real estate agents’ security, just imagine how risky it is for a sale by owner. We know that 92% of all sales go through an agent. Most sellers don’t realize that only 4% of buyers viewing their home are qualified to buy it. Some don’t have the income. Others don’t have the credit necessary to purchase. A large percentage has locked equity, meaning they must sell something before they can purchase. This requires an agent to solve that problem. It is very frightening to sell and buy simultaneously and to coordinate financing on both properties and all the closing details when you don’t know what you’re doing. Buyers and sellers have fears and all these must be met. A for sale by owner can’t do it. Buyers don’t trust sellers because they have fears, just like the seller does. Somebody with knowledge and people skills must manage all this. Quite often we get sellers who contact us telling us they’ll pay us a certain percent to sell their home. They mistakenly believe they’ll save part of the commission doing this, essentially becoming their own listing agent. First off, they won’t have an agent representing them. Secondly, they won’t have an agent marketing their home. We go out and create buyers for each of our listings. We target buyers online by the inventory we have. When we don’t have the sale by owner in inventory, we aren’t out creating buyers for that home. Real estate today isn’t like the old days where you put up a sign, placed it in MLS, maybe took out a generic ad in paper, and hoped someone else would sell it. Reaching buyers today is more sophisticated. We buy the data and target the buyers. We have the ability to search for buyers based upon their income, age group, lifestyle, whether they’re likely to make a move, etc. Let’s say we list a property in a 55+ community. It would do no good to target 30 year olds when they can’t live there. We can target 55+ yr old buyers. Or perhaps we list a property with tennis courts. We can target buyers who are interested in playing tennis. The same is true for waterfront homes, golf course homes, gated communities, etc. We go out and find buyers based upon our seller’s needs. If a for sale by owner thinks they’re going to save part of the commission by offering all agents a fee to sell their home, they’ll be missing on the prime benefit of listing with an agent. Two separate studies show for sale by owners receive 16% less than properties sold with an agent. By giving away 16% are they really saving anything? No, it’s costing them not to use an agent. If you doubt us, go ahead and try it for a few weeks. Then call us at 239-489-4042. Or just call us upfront. If we put a lot more money in your pocket at closing because we attract more buyers, we don’t cost you anything. Imagine selling in an online auction. Do you think you’ll receive more if you have 1,000 qualified buyers versus only 1? Let us open the door to finding good qualified buyers for you. Visit our website and search for your dream home www.LeeCountyOnline.com or find out what your property is worth. Good luck and Happy Home Selling! The last few weeks we’ve been bringing readers up to speed on prices and where they’re headed as well as closings for 2016. This week we decided to focus on listings. We’ve been reporting that listing inventory rises slightly for months and here is the latest graph to illustrate that. Listing inventory is seasonal. For some reason, more sellers decide to list in season than other times. I don’t know if they perceive there are more buyers here in season or perhaps they come back to SW Florida and decide to list. For whatever reason is does go up in season which makes using the trend line a little complicated. We did add the trend line which does show a rise in inventory going forward. Year over year numbers are up each month so this is accurate. 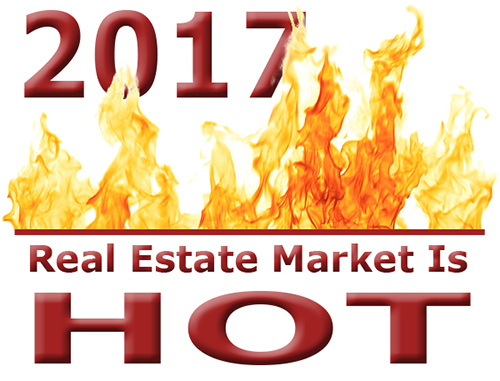 The real question is going to be, with slowing sales, rising rates, and stagnant home prices, what will happen in 2017? The amount of inventory in 2017 will most likely affect home prices as much as interest rates do. We’ve seen rising prices up until this year partly because listing inventory has been so low for so many years. As new construction and existing home inventory begins to rise, we’re seeing prices level off. We’re not sure if it’s the chicken or the egg. Does listing inventory rise because prices stagnate or do prices stagnate because inventory is rising? We think they go hand in hand and affect each other. The SW Florida real estate market is totally balanced right now. You might say it’s a perfectly healthy market. Buyers and sellers are at an equal advantage right now. In the lower price ranges, it’s a seller’s market and in the upper ranges it’s a buyer’s market. The mid-market is balanced. Buyers, sellers, and agents alike complain when the market is skewed too far in any one direction. It is not often we can say the market is perfectly balanced, but at the end of 2016 I think we can. Our market is like a teeter totter and it is straight right now. As you know, it doesn’t take much to alter a teeter totter and they don’t stay straight for long. Our market has been slowly moving from a seller’s market to balanced. It could go either way from here. It depends on interest rates, consumer confidence, and the economy. What Role Will Election Play? We think the election results will go a long way to resolving some of this. Interest rates will probably rise in 2017. Consumer confidence will be swayed by the economy and confidence in the election results. Who holds the presidency? Who controls the Senate, and the House? Is the election in dispute? Is the winner under investigation and facing indictment? We don’t know how the election will turn out. Nobody knows how the winner and loser will react post election. We don’t know who will control congress. You’re witnessing is the craziest election we’ve ever seen, and could get crazier after the election. All we do know is we have uncertainty. Uncertainty may hold back interest rates for a while, but it may also hold back the economy. We don’t control any of this. All we can do is advise our clients and help them make the best real estate decisions for their family. If you’re thinking of buying or selling, call the SW Florida real estate authority, the Ellis Team, 239-489-4042 or visit our MLS website. While we may not be able to tell you who will win the election, we can advise you on your real estate decisions. Use our website to find out how much your home is worth for Free or search the MLS. Neighborhood market reports are available for neighborhoods you’re interested in. And be sure to buy some popcorn this weekend because next Tuesday will be must-see TV. Good luck and Happy House Hunting! Find out how you can win a Yeti cooler valued at $350. It’s easy and it’s fun.